saturday's meeting with lya armovit at ready to wed went extremely well... i've booked my entourage dresses with her! i asked my 2 bridesmaids and 1 secondary sponsor (aka the girls) to fit the dresses i found there. my 2 bridesmaids C and T looked great in the fuschia pink strapless tea-length dress in shantung silk - so i bought the 2 remaining pieces (best part is they were on sale!) and asked lya to alter the dresses to C & T's sizes. as for my secondary sponsors, i've decided to have them in the same dress and fabric, but with spaghetti straps and in a lighter shade. since there isn't any existing color of the dress i wanted in the store, lya will make it for me - at the current retail price of the dress which design i'm using! now all i need are the measurements of the 2 secondary sponsors & junior bridesmaid who are coming from vancouver. after negotiations, instructions, and computations, lya asked me if i might be interested in getting my wedding gown from her as well. i figured that since i was there already, i might as well try on the gowns available. for some strange serendipitous reason, on display was a bridal skirt with embroidered organza over satin - similar to one of april & karen yu's gowns on display during the bridal fair. so i tried it on with 2 different top combinations and walked around the store. at first, i wasn't that interested in a 2-piece bridal gown, but lya said that she actually makes it into a whole gown since it's made-to-measure. i must admit - trying on the gown was like reaching for the apple in the garden of eden. argh! to top it all off, her prices are much lower that april & karen's, plus i get to see the finished product right in front of me, without any fear that it might turn out ugly. well money is money (grr, it's so hard to part with hard-earned money!) so for the 3rd time, i'm changing my mind -- final answer na this time since i'm giving a deposit on monday. i just might ask april & karen to make the maid of honor's gown. wedding favors - needs a separate list! uh-oh, march na -- YIKES! work kasi e, sagabal sa wedding plans. We wish you much hugs, kisses, and lots of chocolate today! Happy Valentine's Day from Aldo & Pia! last wednesday i met with april and karen yu for revisions to their sketches and fabrics, making it our 2nd official meeting. i liked the sketches they made for the bridal gown and entourage gowns - and more importantly, our budget can afford them! hehehe. i've liked them ever since i stumbled on their table at the Wedding March bridal fair at the NBC Tent because whenever i talk to them, it feels like i'm talking to old high school friends, plus they are neither in the traditional nor weird end of the design spectrum. they gave me 3 sketches for the bridal gown and i loved all of them - but fell in love with one because it was pretty creative and not the usual strapless gown. i had to meet them for an explanation though because i couldn't really visualize it too well. so they gave me Elie Saab as a reference to the skirt panels... lo and behold, Elie Saab's gown is named Hera - aldo's ex is named hera. LOL. but i digress... i'm signing a contract with april and karen when all the sketches and costs are final. they say they'll take measurements in june (argh, 4 months na lang to at least try and lose weight!) so we have lots of time (to change gown designs yaay!). i love it that they combine nice fabrics - they'll be using duchesse satin and indian silk organdy on my gown, with a 4 meter train and matching broach for accents (4 meters? that sounds like my height!)... plus a petticoat for a semi-pouffy effect! 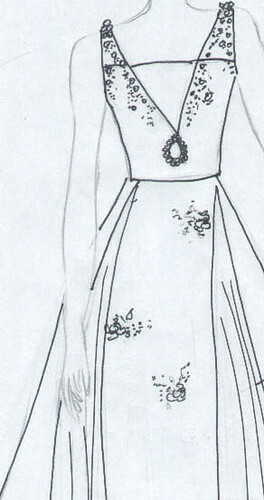 i'm hoping that the gown turns out even prettier than the sketch! I sealed the packet this morning after checking the contents a thousand times - let's hope I did not forget anything. DHL, don't fail me now. Now back to regular wedding planning. Whew! none - not hooked up on dsl yet!